Contrary to widespread claims by industry promoters, nuclear is NOT a low-carbon source of energy, and funding nuclear crowds out the development of better sources of alternative energy. Mark Jacobson – the head of Stanford University’s Atmosphere and Energy Program – who has written numerous books and hundreds of scientific papers on climate and energy, and testified before Congress numerous times on those issues – notes that nuclear puts out much more pollution (including much more CO2) than windpower, and 1.5% of all the nuclear plants built have melted down. Jacobson also points out that it takes at least 11 years to permit and build a nuclear plant, whereas it takes less than half that time to fire up a wind or solar farm. Between the application for a nuclear plant and flipping the switch, power is provided by conventional energy sources … currently 55-65% coal. Nuclear power cannot be globally scaled to supply the world’s energy needs for numerous reasons. The results suggest that we’re likely better off investing in other energy solutions that are truly scalable. In his analysis, Abbott explores the consequences of building, operating, and decommissioning 15,000 reactors on the Earth, looking at factors such as the amount of land required, radioactive waste, accident rate, risk of proliferation into weapons, uranium abundance and extraction, and the exotic metals used to build the reactors themselves. His findings, some of which are based on the results of previous studies, are summarized below. Land and location: One nuclear reactor plant requires about 20.5 km2 (7.9 mi2) of land to accommodate the nuclear power station itself, its exclusion zone, its enrichment plant, ore processing, and supporting infrastructure. Secondly, nuclear reactors need to be located near a massive body of coolant water, but away from dense population zones and natural disaster zones. Simply finding 15,000 locations on Earth that fulfill these requirements is extremely challenging. Lifetime: Every nuclear power station needs to be decommissioned after 40-60 years of operation due to neutron embrittlement – cracks that develop on the metal surfaces due to radiation. If nuclear stations need to be replaced every 50 years on average, then with 15,000 nuclear power stations, one station would need to be built and another decommissioned somewhere in the world every day. Currently, it takes 6-12 years to build a nuclear station, and up to 20 years to decommission one, making this rate of replacement unrealistic. Nuclear waste: Although nuclear technology has been around for 60 years, there is still no universally agreed mode of disposal. 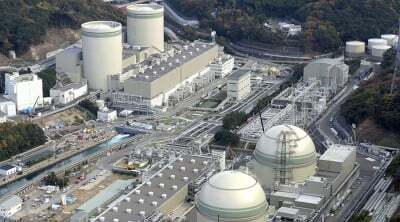 It’s uncertain whether burying the spent fuel and the spent reactor vessels (which are also highly radioactive) may cause radioactive leakage into groundwater or the environment via geological movement. Accident rate: To date, there have been 11 nuclear accidents at the level of a full or partial core-melt. [And see this]. These accidents are not the minor accidents that can be avoided with improved safety technology; they are rare events that are not even possible to model in a system as complex as a nuclear station, and arise from unforeseen pathways and unpredictable circumstances (such as the Fukushima accident). Considering that these 11 accidents occurred during a cumulated total of 14,000 reactor-years of nuclear operations, scaling up to 15,000 reactors would mean we would have a major accident somewhere in the world every month. Uranium extraction from seawater: Uranium is most often mined from the Earth’s crust, but it can also be extracted from seawater, which contains large quantities of uranium (3.3 ppb, or 4.6 trillion kg). Theoretically, that amount would last for 5,700 years using conventional reactors to supply 15 TW of power. (In fast breeder reactors, which extend the use of uranium by a factor of 60, the uranium could last for 300,000 years. However, Abbott argues that these reactors’ complexity and cost makes them uncompetitive.) Moreover, as uranium is extracted, the uranium concentration of seawater decreases, so that greater and greater quantities of water are needed to be processed in order to extract the same amount of uranium. Abbott calculates that the volume of seawater that would need to be processed would become economically impractical in much less than 30 years. Exotic metals: The nuclear containment vessel is made of a variety of exotic rare metals that control and contain the nuclear reaction: hafnium as a neutron absorber, beryllium as a neutron reflector, zirconium for cladding, and niobium to alloy steel and make it last 40-60 years against neutron embrittlement. Extracting these metals raises issues involving cost, sustainability, and environmental impact. In addition, these metals have many competing industrial uses; for example, hafnium is used in microchips and beryllium by the semiconductor industry. If a nuclear reactor is built every day, the global supply of these exotic metals needed to build nuclear containment vessels would quickly run down and create a mineral resource crisis.This is a new argument that Abbott puts on the table, which places resource limits on all future-generation nuclear reactors, whether they are fueled by thorium or uranium. No wonder a former Commissioner for the U.S. Nuclear Regulatory Commission says that building nuclear plants to fight global warming is like trying to fight global hunger by serving everyone caviar. The Nuclear Regulator Commission say that the risk of a major meltdown at U.S. nuclear reactors ismuch HIGHER than it was at Fukushima. And an accident in the U.S. could be a lot larger than in Japan … partly because our nuclear plants hold alot more radioactive material. Nuclear energy can be cheap, or it can be safe … but it can’t be both. And America’s nuclear reactors are old … and are falling apart piece by piece. Even operating “normally”, nuclear plants leak radiation. For example, an investigation by Associated Press found that 75 percent of all U.S. nuclear sites have leaked radioactive tritium. And prolonged exposure to even SMALL doses of radiation can cause cancer and other fatal illness. And nuclear is wholly subsidized by the government, and would never survive in a free market. We spent ten times more money for PR campaigns than we did for real safety measures. It’s a terrible thing. The Nuclear Energy Institute [NEI] spent about $1.69 million lobbying Congress and the White House last year, according to records filed with the Senate. Twenty-two utilities and utility trade groups each spent more than that on advocacy, often on a range of issues, according to the Center for Responsive Politics in Washington. Executives and employees of utilities also contributed to political campaigns. Exelon spent more than $3.7 million lobbying last year. The company’s executives and employees contributed more than $514,000 to congressional candidates …. NEI spent nearly $45 million on industry coordination, policy development, communications, and “governmental affairs” in 2006, according to its most recent financial report. That doesn’t include lobbying by individual companies with a stake in the nuclear power business, such as Entergy, Exelon, or Duke Energy. And some of Obama’s top funders are connected with the nuclear power industry. Bottom line: Nuclear is not the answer.